Well finished except for the varnishing. Eight Indian Navy kilo class submarines on the left ready to take on the PLAN. 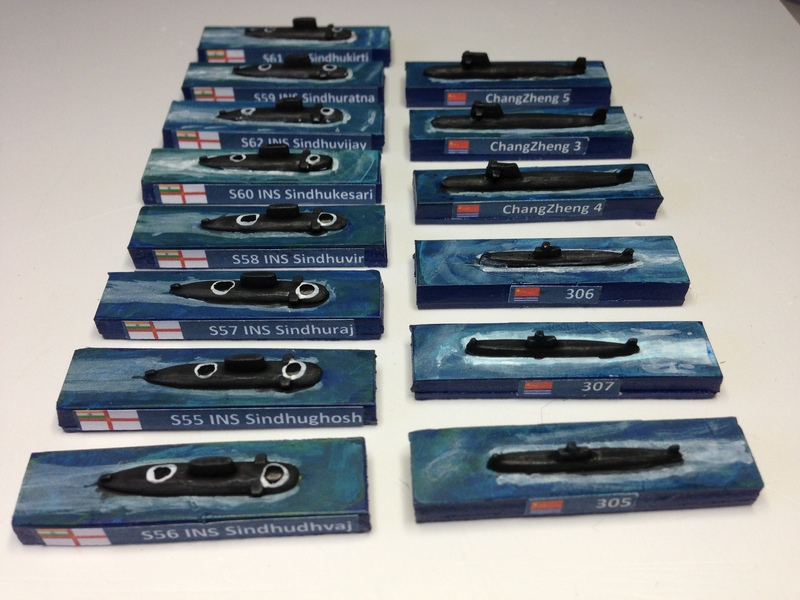 The PLAN are not defenceless and facing off against the Indians are three Han-class nuclear submarines to the rear at the right and three Ming-class submarines at the front. The Ming-class are Chinese built based on the Romeo-class diesel-electric submarines built by the Soviet Union in the 1950s. The Romeo-class can be traced to the World War II German Type XXI Elektroboot U-boat. At the end of World War II, the Soviets obtained several Type XXIs, from which they were able to obtain key technologies. These technologies also assisted in the design of the Zulu- and Whiskey-class. Further improvements on the design led to the Romeo class. These submarines really are obsolete, but still have some value as training and surveillance vessels. China has operated an estimated 84 but 31 are still in use for training. The Han-class is a 4,500/5,500-ton vessels and the first nuclear-powered submarine (SSN) class deployed by the People’s Liberation Army Navy. The first submarine in the class was commissioned in 1974 and the fifth and final boat of the class was commissioned in 1990. The Han-Class is the among the first generation of nuclear-powered submarines in the People’s Liberation Army Navy. The Han-Class is well known for having a noisy reactor and poor radiation shielding. The submarine is also inhibited by an inability to launch missiles while submerged. A Han shadowed a U.S. carrier battle group in the mid-1990s. In November 2004, a Han made an incursion into Japanese territorial waters and prompted Japan’s maritime forces to go on alert for only the second time since the end of World War II. The incursion was through the Ishigaki, Okinawa island group, a lightly populated group of islands very near Taiwan. China later apologized for the incursion saying for “technical reasons,” it ventured into Japanese waters. The Kilo-class is a naval diesel-electric submarine that is made in Russia. The original version of the vessels were designated Project 877 Paltus (Halibut) in Russia. The boats are mainly intended for anti-shipping and anti-submarine operations in relatively shallow waters. All models are from Navwar. Nice one… I am looking forward to seeing more finished articles.